The process is called ‘ferritic nitrocarburizing’ and it imparts nitrogen and carbon into the molecules of the machined casting. The nitrogen and carbon enrichment of the base material enhance fatigue characteristics while forming a ɛ ‘epsilon’ carbonitride layer, commonly referred to as compound or white layer. This white layer forms a corrosive barrier and is very hard, yet ductile which increases resistance to wear and rotor life. Ultrawear ® is a thermal chemical diffusion process. It is important to note that it is not a coating. 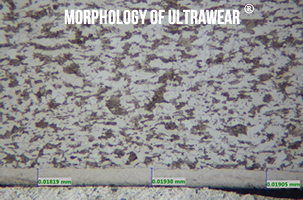 Ultrawear ® is a nanotechnology and alters the base material’s structure at the molecular level. Ultrawear ® forms a hard outer layer with hardnesses capable of exceeding Rockwell C 70. Even though it is hard it is ductile. Depths can vary from as little as 1 micron to as much as 100 microns. diffusion increases base material fatigue. Ultrawear ® is a “green” technology.